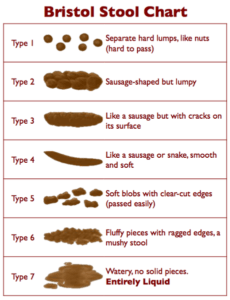 The Bristol Stool Chart is considered the authoritative visual aid in patient stool health awareness. While there are several out there, this visual comes from the University of Bristol where it was developed. It can be helpful in diagnoses, but is not itself a diagnostic tool. Type 1 and 2 is constipated. This can be due to a low fiber diet, dehydration, or colon disease. Types 3 and 4 are ideal, and should be passed 1-3 times daily. Type 5,6,7 is considered diarrhea. It may be indicative of digestive disease, bacterial or viral infection, or food intolerances. If you experience stools consistently outside ideal range it would be worth consulting your doctor or another health professional about your digestive health.